MIT researchers have successfully cooled a gas of sodium potassium (NaK) molecules to a temperature of 500 nanokelvin. 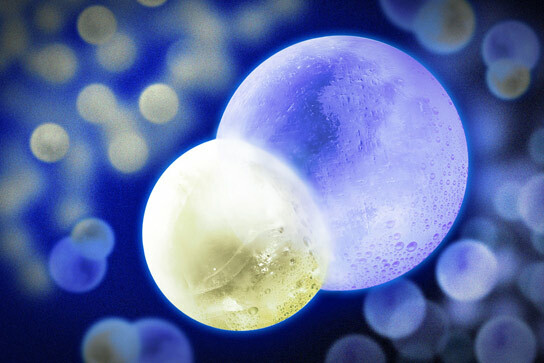 In this artist’s illustration, the NaK molecule is represented with frozen spheres of ice merged together: the smaller sphere on the left represents a sodium atom, and the larger sphere on the right is a potassium atom. A team of physicists from MIT has successfully cooled molecules in a gas of sodium potassium (NaK) to a temperature of 500 nanokelvins, creating ultracold molecules. The air around us is a chaotic superhighway of molecules whizzing through space and constantly colliding with each other at speeds of hundreds of miles per hour. Such erratic molecular behavior is normal at ambient temperatures. But scientists have long suspected that if temperatures were to plunge to near absolute zero, molecules would come to a screeching halt, ceasing their individual chaotic motion and behaving as one collective body. This more orderly molecular behavior would begin to form very strange, exotic states of matter — states that have never been observed in the physical world. Now experimental physicists at MIT have successfully cooled molecules in a gas of sodium potassium (NaK) to a temperature of 500 nanokelvins — just a hair above absolute zero, and over a million times colder than interstellar space. The researchers found that the ultracold molecules were relatively long-lived and stable, resisting reactive collisions with other molecules. The molecules also exhibited very strong dipole moments — strong imbalances in electric charge within molecules that mediate magnet-like forces between molecules over large distances. Martin Zwierlein, professor of physics at MIT and a principal investigator in MIT’s Research Laboratory of Electronics, says that while molecules are normally full of energy, vibrating and rotating and moving through space at a frenetic pace, the group’s ultracold molecules have been effectively stilled — cooled to average speeds of centimeters per second and prepared in their absolute lowest vibrational and rotational states. Zwierlein, along with graduate student Jee Woo Park and postdoc Sebastian Will — all of whom are members of the MIT-Harvard Center of Ultracold Atoms — have published their results in the journal Physical Review Letters. Every molecule is composed of individual atoms that are bonded together to form a molecular structure. The simplest molecule, resembling a dumbbell, is made up of two atoms connected by electromagnetic forces. Zwierlein’s group sought to create ultracold molecules of sodium potassium, each consisting of a single sodium and potassium atom. However, due to their many degrees of freedom — translation, vibration, and rotation — cooling molecules directly is very difficult. Atoms, with their much simpler structure, are much easier to chill. As a first step, the MIT team used lasers and evaporative cooling to cool clouds of individual sodium and potassium atoms to near absolute zero. They then essentially glued the atoms together to form ultracold molecules, applying a magnetic field to prompt the atoms to bond — a mechanism known as a “Feshbach resonance,” named after the late MIT physicist Herman Feshbach. The resulting bond is relatively weak, creating what Zwierlein calls a “fluffy” molecule that still vibrates quite a bit, as each atom is bonded over a long, tenuous connection. To bring the atoms closer together to create a stronger, more stable molecule, the team employed a technique first reported in 2008 by groups from the University of Colorado, for potassium rubidium (KRb) molecules, and the University of Innsbruck, for non-polar cesium­ (Ce2­) molecules. For this technique, the newly created NaK molecules were exposed to a pair of lasers, the large frequency difference of which exactly matched the energy difference between the molecule’s initial, highly vibrating state, and its lowest possible vibrational state. Through absorption of the low-energy laser, and emission into the high-energy laser beam, the molecules lost all their available vibrational energy. With this method, the MIT group was able to bring the molecules down to their lowest vibrational and rotational states — a huge drop in energy. “In terms of temperature, we sucked away 7,500 kelvins, just like that,” Zwierlein says. In their earlier work, the Colorado group observed a significant drawback of their ultracold potassium rubidium molecules: They were chemically reactive, and essentially came apart when they collided with other molecules. That group subsequently confined the molecules in crystals of light to inhibit such chemical reactions. Zwierlein’s group chose to create ultracold molecules of sodium potassium, as this molecule is chemically stable and naturally resilient against reactive molecular collisions. In their experiments, Park, Will, and Zwierlein observed that their molecular gas was indeed stable, with a relatively long lifetime, lasting about 2.5 seconds. By first cooling atoms to ultralow temperatures and only then forming molecules, the group succeeded in creating an ultracold gas of molecules, measuring one thousand times colder than what can be achieved by direct cooling techniques. This research was supported in part by the National Science Foundation, the Air Force Office of Scientific Research, the Army Research Office, and the David and Lucile Packard Foundation. Be the first to comment on "MIT Physicists Create Ultracold Molecules of 23Na40K"